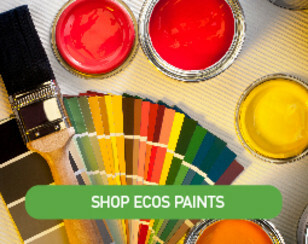 The purpose of this article is to articulate in convincing detail the characteristics of various types of eco-friendly countertops and to help you choose the one that best fits your lifestyle, budget, enlivens your bliss, and keeps you from getting ill. The list below is not exhaustive but represents the most popular types. By using this information, you’ll avoid the irrational pitfalls of buying something just because everyone else has one or just because of the color. There is much more to choosing a countertop, as you will soon see. What makes a countertop eco or green? The definition of green means many things to different people. How it is made, the origin of the materials, how it is fabricated, fairness of wages, effects on environment, carbon footprint, useful life, afterlife, etc. Only you can decide which characteristics are most important to you. For us at Green Building Supply, safety will always be our #1 priority. All of the countertops that we sell at our store in Fairfield, Iowa and online are safe for food use. When it comes to food safety and sanitation, the National Sanitation Foundation (NSF) (nsf.org) is considered one of the global leaders. Their worldwide laboratories act as a third-party certifier that tests, inspects, registers, and validates appliances, food equipment, cosmetics, drinking water filters, plumbing, and many other personal care products. The NSF label means a product meets their criteria for safety. The absence of this label does not mean a product is worse than another. However, the presence of the label certainly lends credibility. 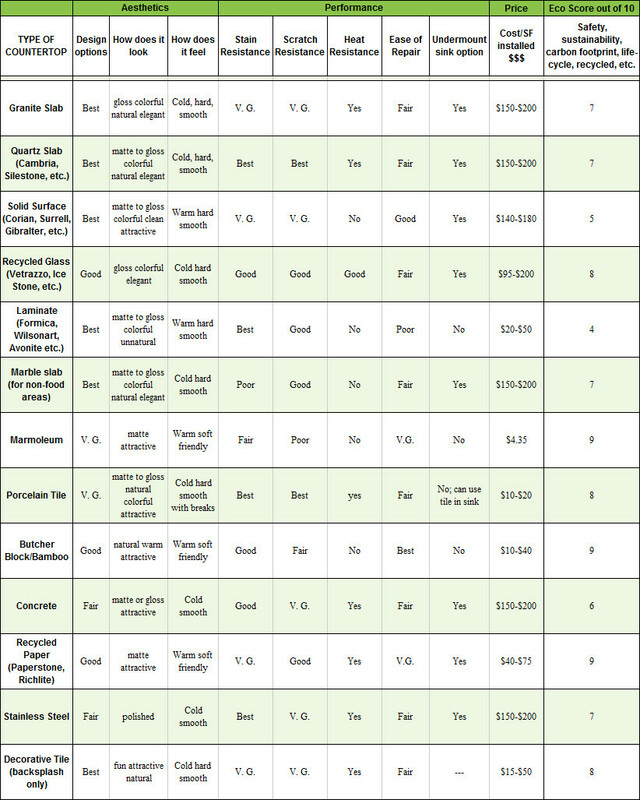 Most of the countertops listed above have NSF labels and are considered food safe. However, even those without this label can be equally safe if sealed properly. All of the wood, bamboo, and natural stone products are porous and require regular sealing that should be made of natural oils or waxes. Beware of sealants containing harmful solvents that are not food safe. More info about our sealers here. Are laminate countertops hazardous to your health? 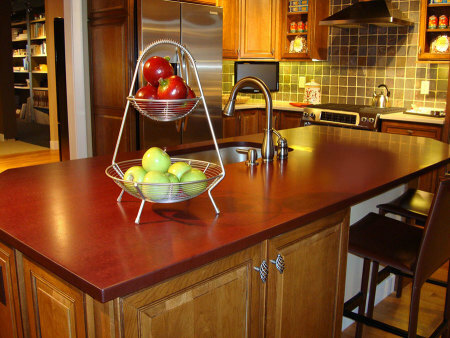 Formica, Wilsonart, Nevamar, etc., are common laminates that are tough, long-lasting, and reasonably priced. They are not included on our list of eco countertops because they are almost always glued to a chipboard substrate that can be full of urea formaldehyde, which may have a negative impact on your health and may off-gas for years. Unfortunately, there is not much you can do to avoid this toxic emission unless you seal the substrate before installation with our AFM SafeSeal. However, once the countertop is installed, it is nearly impossible to access and seal it. Should you decide to purchase a laminate countertop, always insist on no added urea formaldehyde substrate. 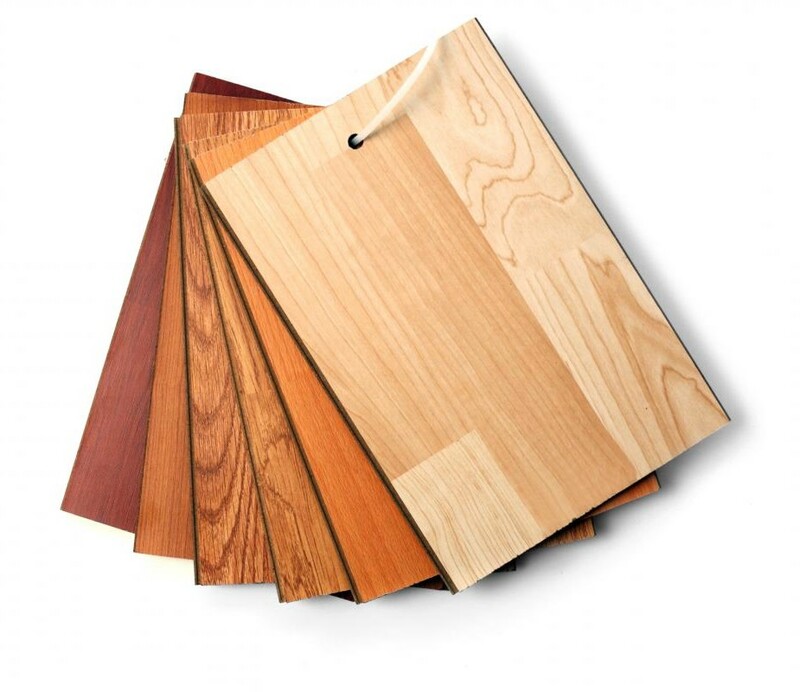 The other reason we don’t recommend laminates is because they are made using petroleum-based ingredients and are not sustainable. They can be scratched, but like stainless steel, they are not very repairable. 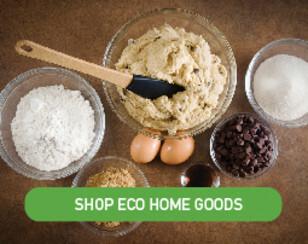 Bamboo Butcher Block countertops are made from a renewable resource, are non-toxic, recyclable, and have a low carbon footprint. Much like maple butcher block, bamboo cuts, stains, and finishes easily with normal shop tools. Bamboo also requires the same routine maintenance as maple or other hardwoods. 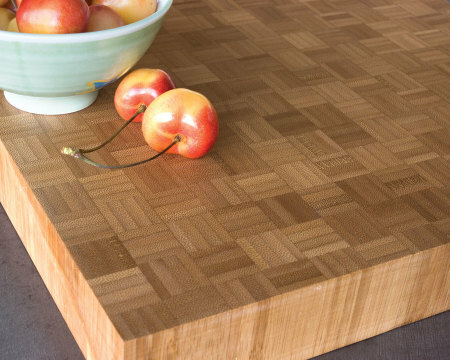 Teragren bamboo countertops come in a butcher block or strand bamboo style. They also come in two sizes: 1 ½” x 30” x 9”6 or 1 ½” x 36” x 72”. A bamboo countertop is one of the least expensive options and could easily last the life of your home, if cared for properly. Try one of our Totally Bamboo butcher block cutting boards first if you think these might be for you. The Paperstone and Richlite brands are NSF-certified and both made in the USA of 100% recycled paper that is certified by the Forest Stewardship Council (FSC). They are non-toxic, heat-resistant to 350 degrees, and highly resistant to moisture. While they can be scratched if you cut on them, the scratches don’t show once oiled, and these countertops can be re-sanded. Recycled paper countertops hold up well to cutting and won’t dull your knives. If you want to test one, we recommend buying a cutting board made by Epicurean. These are very durable; minor cuts do not diminish the look of the board, and they are dishwasher safe. Like bamboo, the surface is warm, requires minimal maintenance, and is repairable. It can also be routered and fabricated in the field by a good finish carpenter. It comes in ¼” to 2” thicknesses with numerous sizes up to 12’ long; this material lends itself to a variety of larger scale projects and many other commercial uses. 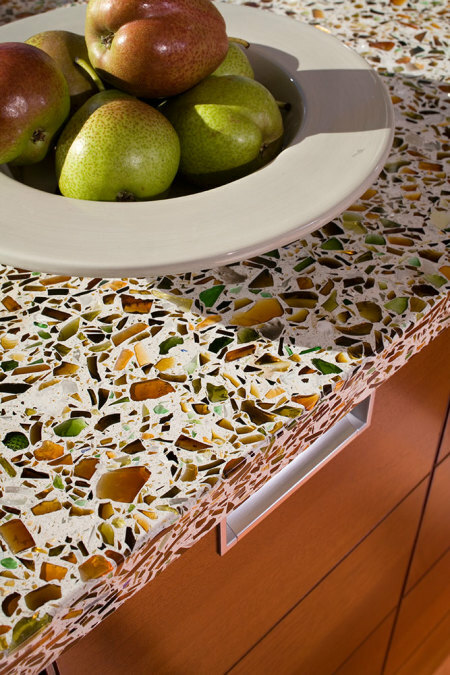 Recycled Glass countertops offer an exceptional splash of color and vibrancy not found in any other countertop. Made with recycled glass from many sources in the USA including: beer, pop, vodka bottles, auto glass, and stop lights. The combination of browns, blues, greens, and sometimes reds makes for a showpiece that will dazzle and excite just about everyone. 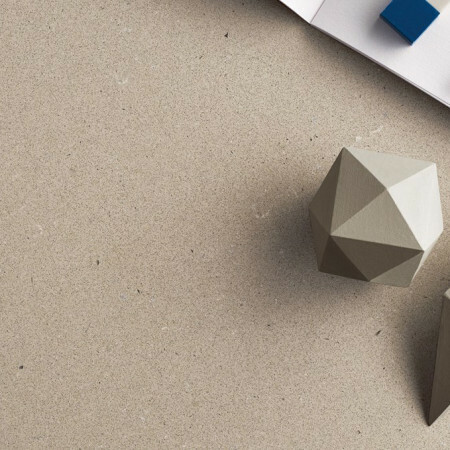 Marmoleum is a 100% bio-based natural linoleum sheet that can be easily and inexpensively applied to almost any smooth surface. While you may think it’s only used for flooring, there are dozens of applications for this product, including countertops and furniture. In fact, many of the original Airstream travel trailers were outfitted for decades with Marmoleum on their counters, walls, and floors. Because it is inexpensive (appx $4-$5/SF), easy to work with, and beautiful, Marmoleum has found a place on desktops and kitchen countertops worldwide. Made in Europe and NSF certified. Out of all the countertop options, this is one of the least expensive options. There are hundreds of beautiful colors and styles in sheets of 79” by any length up to 98 linear feet long. 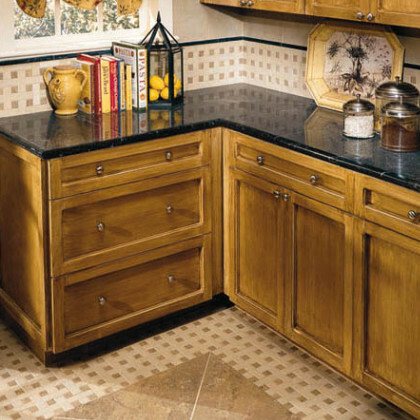 Natural Stone, such as granite, marble, limestone, quartzite, and soapstone are still the most popular countertops. Although they are mined in an energy intensive process from many third world countries such as China, India, and Brazil, they contain many useful, long-lasting attributes. 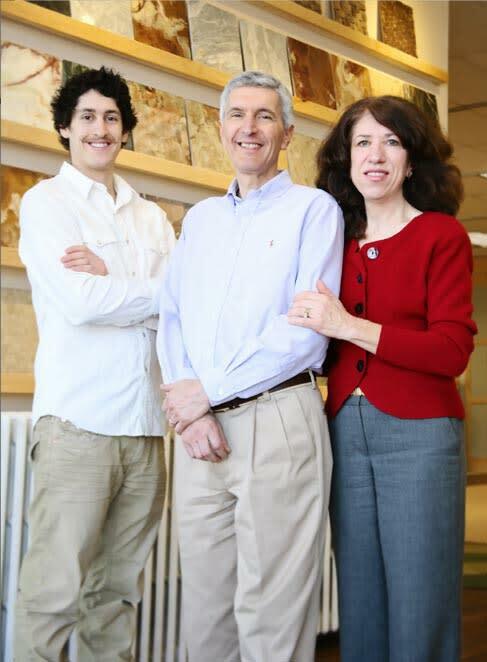 Stone countertops must be made locally by a professional who will template, fabricate and install your countertop. Natural stone is beautiful, safe, and relatively easy to maintain. The radon scare in granite of 10 years ago has long been put to rest. Quartz countertops are the hottest trend in kitchens for many good reasons: they’re extremely scratch, heat, and moisture resistant, far more than natural stone, and they never require sealing. 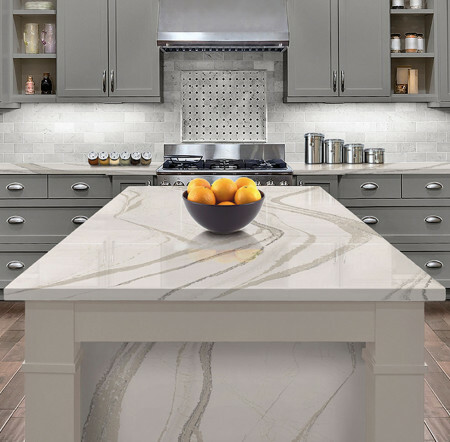 Unlike natural stone that can vary from slab to slab, quartz is highly consistent and what you see in a sample is what you get in the countertop. They are made with 95%+ natural quartz along with an epoxy resin binder. They don’t contain toxic chemicals. All are NSF certified. However, some (Silestone) contain Micro-ban, which is an antimicrobial, considered safe by some but questionable by others. Concrete countertops have been around for decades. They are an artisan product that can be customized and beautiful but—usually expensive. They are porous and require regular sealing, and they can develop hairline cracks. They are only available in a few colors, and there are few people who have the skills to make these. We’ve seen some beautiful shapes and designs with concrete countertops and even some awesome colors, but they don’t seem to fulfill all of the requirements that most people desire. Porcelain Tile countertops have also been around for decades, but are far less expensive and are available in just about any size, color, and style you want. 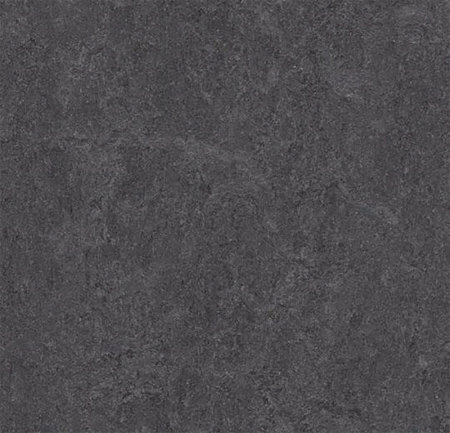 This includes new, super large format tiles that are 39” x 117” with rectified edges, which allow for an almost seamless look. This will require a professional tile setter. What makes choosing a countertop so dreadfully difficult? The information below has been extracted from years of experience in the industry as well as articles from architects, interior designers, fabricators, and kitchen and bath specialists. Using this matrix will help you find some middle ground that will keep your project on budget and add harmony to your household. Prices are rough estimates for comparative purposes only. Prices can vary widely depending upon color, style, edge detail, and where you buy. Ok, so now that you’ve seen most of the options, how do you choose? Obviously there are many right answers. Don’t be afraid to choose more than one type of countertop. A current trend in kitchen design is to mix and match different countertops in different areas of the kitchen. If you want one of the higher-end countertops but don’t want to spend that much, then mix it up with something less expensive in areas that may not require the same features. 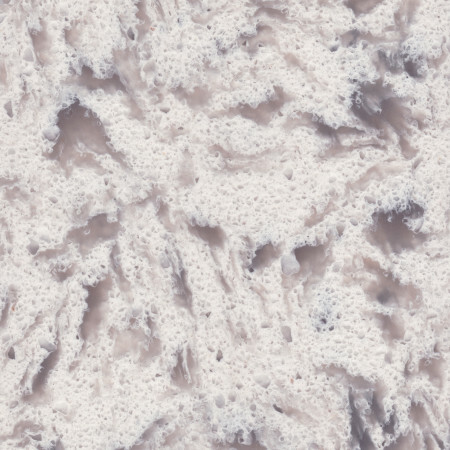 For example, use quartz or granite by your sink where a more resistant surface is desired for food prep and baking. Use bamboo, butcher block, recycled paper, or Marmoleum—all of which are softer and warmer—for islands or peninsulas where you’re more likely to eat, write, or do craft projects. 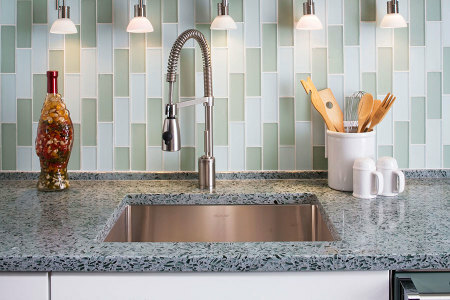 Use recycled glass where you want a splash of color such as bars, vanity tops, or eating areas. Every type of countertop has its pluses and minuses. It’s because of such variety that you can customize your kitchen precisely how you want. And, if you plan ahead, you can change the entire feeling in your kitchen by the countertop you choose. How do the pros pick countertops? They make their own matrices, like the one above, and tailor it to the client’s overall style, color palette, budget, and use. As with any choices in life, the better you know yourself, the easier it is to make important decisions. You may also want to visit houzz.com, read kitchen and bath magazines, visit showrooms, tour homes in the area, and consult with interior designers. Most people put the cart before the horse and start picking counters before they even have their kitchen cabinets picked out. We suggest you choose your cabinets and flooring first; then wait until they are installed to actually shop for counters. At that point in the process, you’ll usually be more rational about what is affordable and what your real needs are. Almost everyone who tries to choose ahead of time ends up changing their minds many times over, wasting everyone’s time and energy. Often it’s best to wait until you can get something you really want. We believe a backsplash looks best when it pulls together all the colors of the flooring, cabinets, and appliances. This takes some patience and lots of research, but it’s worth it. Although it is more expedient and less expensive to match the backsplash with the countertop, nowadays it’s fashionable to use completely different textures and colors to make the cabinetry pop. By the way, there is nothing wrong with having no backsplash for a year or two until you can find just the right backsplash that makes your heart sing. What’s the best cleaner for countertops? 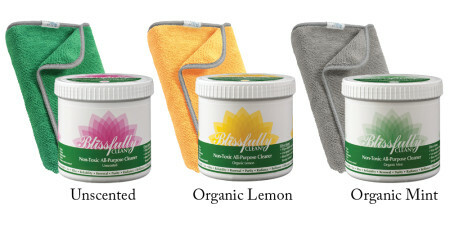 Our Blissfully Clean® clay cleaner is the best all-purpose cleaner for kitchen or bathroom countertops. It’s a non-toxic cleaner made of clay and organic soap, plus organic essential oils if you choose a scent. It is guaranteed to clean every type of solid, non-porous surface as well as appliances, sinks, pots and pans, cutting boards, utensils, glass, stainless steel, and sterling silver, plus windows, automobiles, jewelry, etc. It comes with a PerfectClean medical grade, antimicrobial cloth that uses only water to remove 99.9% of all microbes. It’s a winning combination that is completely safe. Order some countertop samples and try them out in your home to see what looks good and what satisfies your desire for durability. 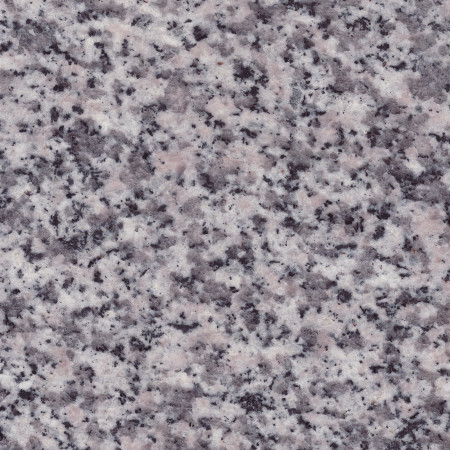 Click here to visit our countertop section. Can a wood butcher block countertop be permanently sealed? What is Marmoleum - and How Does It Differ From Linoleum What are the best "green" products for repainting kitchen cabinets? 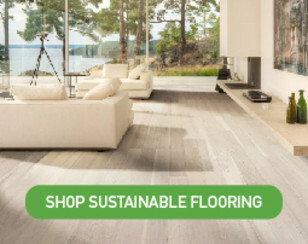 Will a bamboo floor work over my radiant floor? Our newly-installed kitchen sink has a terrible toxic smell. What can we do?